Hey there! 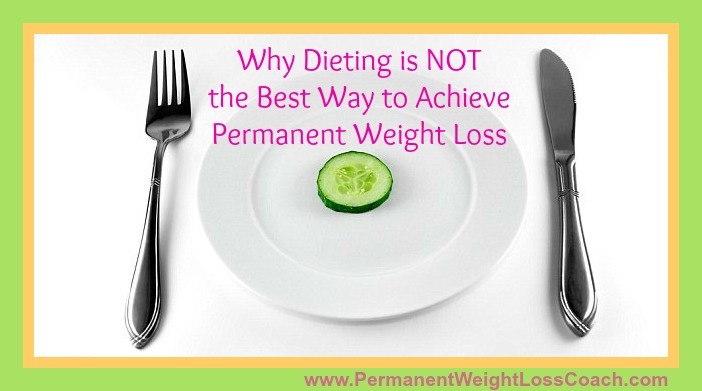 Let’s take a look at why dieting is NOT the best way to achieve permanent weight loss. Especially if you’ve been thinking that it is! In yesterday’s post we asked the question “Is Dieting the BEST Way to Achieve Permanent Weight Loss” and now we’re going to look at WHY it’s not. But first, why do so many smart, successful women believe that a new diet is the answer to their overweight, emotional eating, and binge eating struggle? Clearly this is not a problem of intelligence. Could it be that the problem is a faulty belief system that the mainstream diet industry has sold you? Ok, so why isn’t dieting the best way to achieve permanent weight loss? Well, it’s pretty simple: How do you FEEL when you’re dieting? Do you feel excited? Do you feel deprived? Do you feel like you’re missing out? Or do you feel like you’re on top of the world, thriving in mind and body? The reason that dieting is not the best way to achieve permanent weight loss is because it’s Just Not Fun! Right! How can you live a life of struggle with food and your weight and expect to achieve lasting success with your weight? Hey, anyone can diet and lose weight. I bet you’ve done that many times. But why haven’t you kept the weight off? Is weight loss easy and fun whenever you’ve dieted? How can you live the rest of your life expecting permanent weight loss when it’s a drag for you to live healthy and fit? You see you’ve gotta make it easy and fun to live a healthy lifestyle in order to make weight loss permanent, and that’s NOT what dieting is about. In fact, even the word DIET is the key to why dieting is not the best way to achieve permanent weight loss. Why? Because a mainstream food diet is always short term. That’s always the mindset of anyone who diets. It’s a short term fix for a lifelong problem. Doesn’t it make sense why dieting does not work?! Leave your comments below about today’s article and tell us whether or not dieting has helped you achieve struggle-free, lasting success with your weight. Up next, we’ll look at the 3 best ways to achieve permanent weight loss, so tune in for that! Also, go ahead and share today’s article with your friends using the social media buttons on this page. After all, they deserve permanent weight loss too, right? !